With the main purpose the satisfaction of the Customers’ expectations and requests, it is for them that we must always address our quality purposes, through a strong and continuous involvement of the Management, Employees, Suppliers, Physicians and Insurance and Subsystems Agreements. 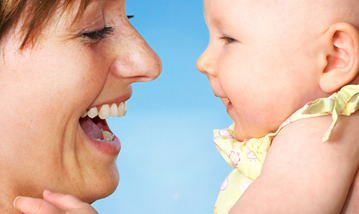 The Employees play a main role in the Quality and in their Continued Improvement. So, the Management promotes the training and support of all the Employees, in order to assure the aware and responsible performance of their duties. All the Employees, irrespective of the functions they perform, are responsible for their actions and for the compliance of this policy, playing the Management a main role in their communication and understanding. The Management assures the compliance with the national and international existing rules, applicable to the laboratory activity, as the way to assure the final quality of the results obtained, thus seeking, the compliance with the Customers’ requirements and of the applicable rules. As a way to assure the quality of the results obtained, the organization sets out procedures and implements internal quality controls (CQI) and participates in external quality assessments (AEQ). There is a strict selection of the suppliers and their evaluation in what concerns the equipment and reagents. The Management is committed to the evolution of the IT system of the Germano de Sousa Group, as a way for the automation of the pre analytical, analytical and post analytical procedures, minimizing as possible the human error and allowing the evidence of all the performed operations. Germano de Sousa Group has a great concern about the quality of the laboratory results it provides to their patients/customers. Accuracy and Precision are a continuous need and an eminent concern and thus we perform always several levels of examples for daily Internal Quality Control, on all the parameters we perform. The letters of the Internal Quality Control are daily monitored by the heads of each section, strictly following the rules implemented by the directors. Their assessment, presented under the form of monthly assessment, is also subject to the opinion of the section's head as well to the opinion of the Quality Manager. 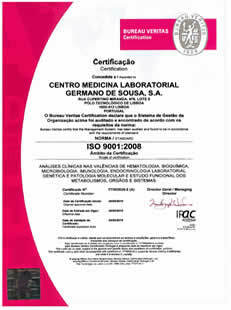 Germano de Sousa Group assumes the implementation of a Quality Management System and the application of these principles as strategy and the way to provide direct benefits for the Laboratory, improving its performance and global capabilities and meeting their Customers’ requirements, needs and expectations effectively and efficiently, with a view to continued improvement. 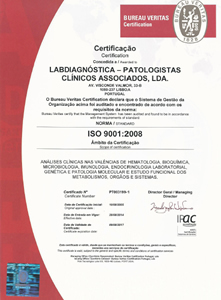 Certificate from Labdiagnóstica - Patologistas Clínicos Associados, Lda. 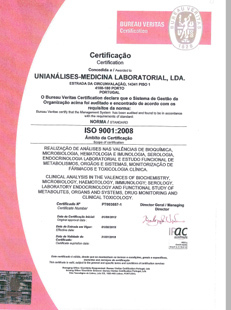 Certificate from Unianálises-medicina Laboratorial, Lda. 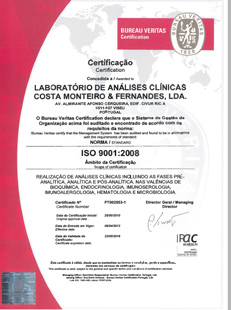 Certificate from Laboratório De Análises Clínicas Costa Monteiro & Fernandes, Lda.